Your website should be the #1 selling channel. Whether you are a hostel, hotel, resort or guesthouse, a website is a perfect tool to drive revenue. This is obvious, since it skips commission on booking platforms. 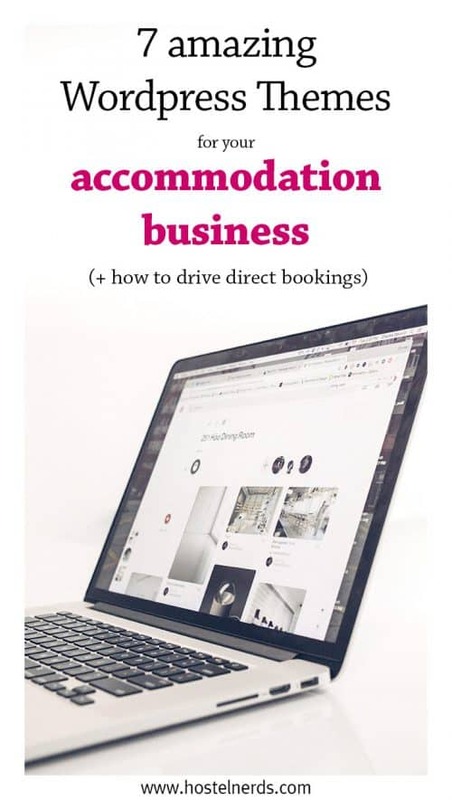 To improve your direct bookings, a website is a first and important step to take. 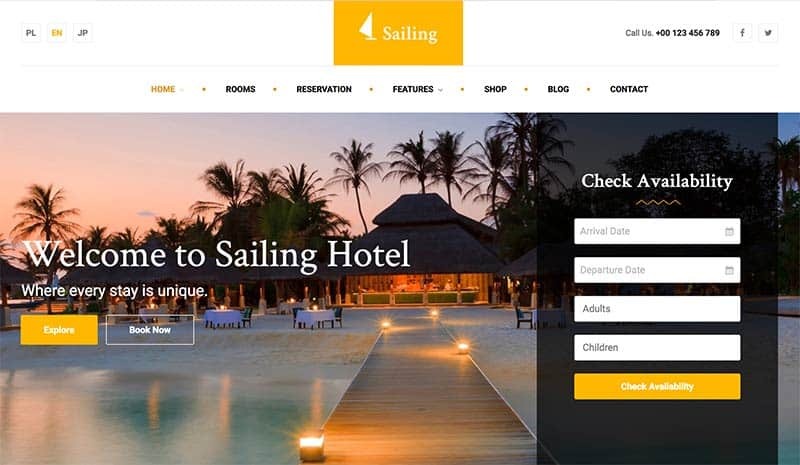 The booking engine must be optimized, and your website visually appealing. 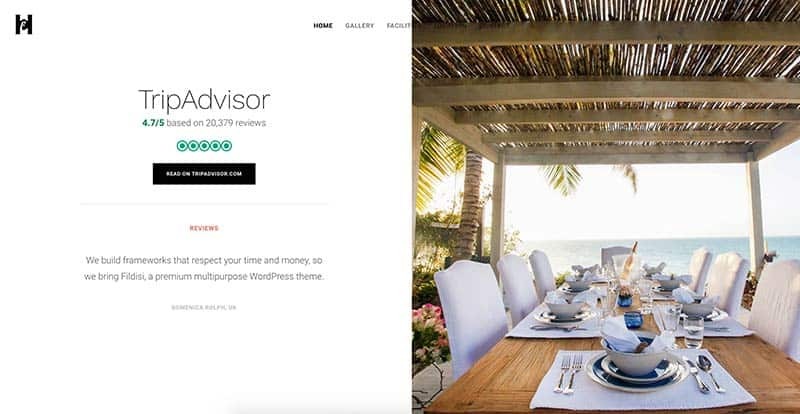 Therefore, here is a list of fantastic wordpress themes, optimized for accommodations. We always recommend using wordpress for your website as a backend. It is the most flexible and easy to use backend. As for purchasing professional themes, we recommend making a account with Themeforest. This is the #1 pool for professional website themes and plugins. We always use it! We always recommend them! Now, let us have a look. 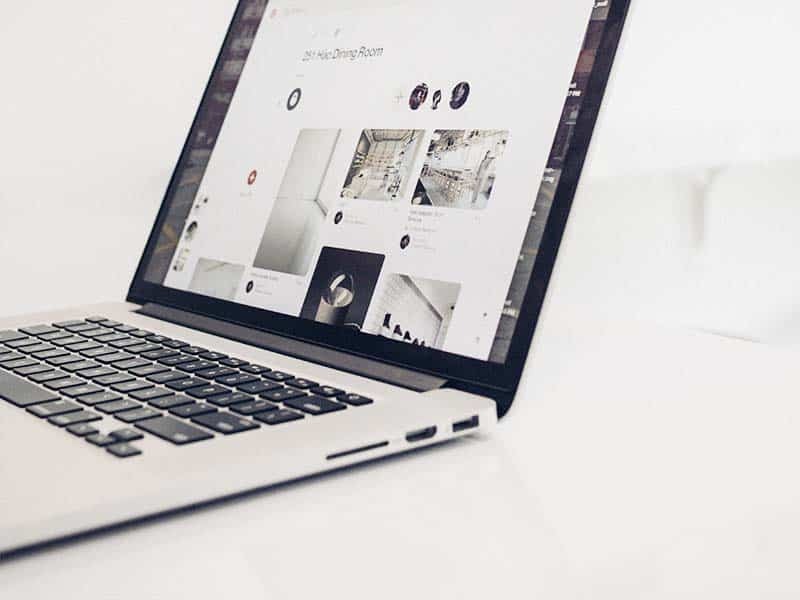 Keep scrolling to get some inspiration for your own website. SEOptimized and ready to drive more direct bookings to your hotel, hostel and guesthouse. This theme is a very attractive theme, that can be turned into a clean and neat website. Make sure you use clear and visually appealing photos, as we always recommend. More information for Sailing Theme here. 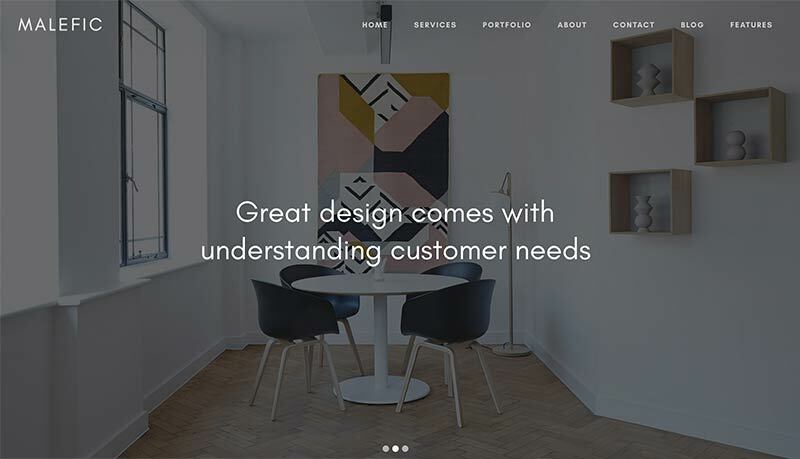 A great showcase theme with a clean and neat design. I think this theme is a great example how easy to navigate and to book a hostel website can be. The photos are optimized for web and speed and the booking process is clean. Also, check out the responsive part of it, meaning, the page is optimized for mobile as well. This is something very, very important and you should pay attention to the mobile design as well. 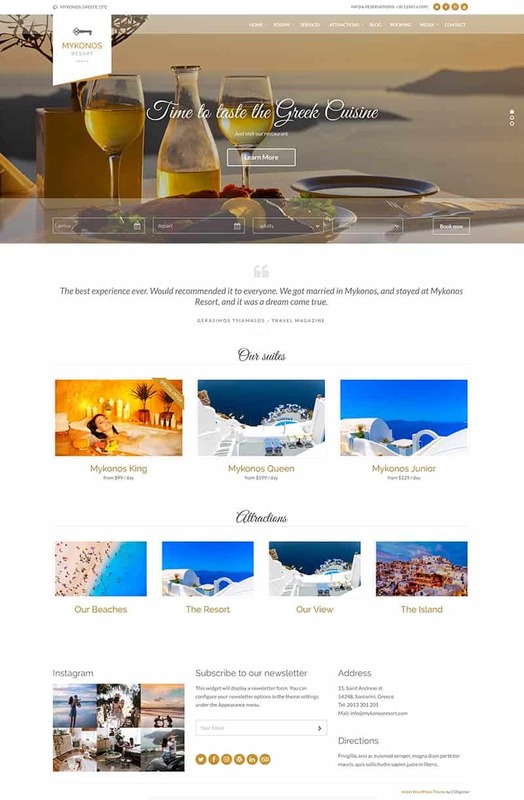 More information for Mykonos Resort Theme here. 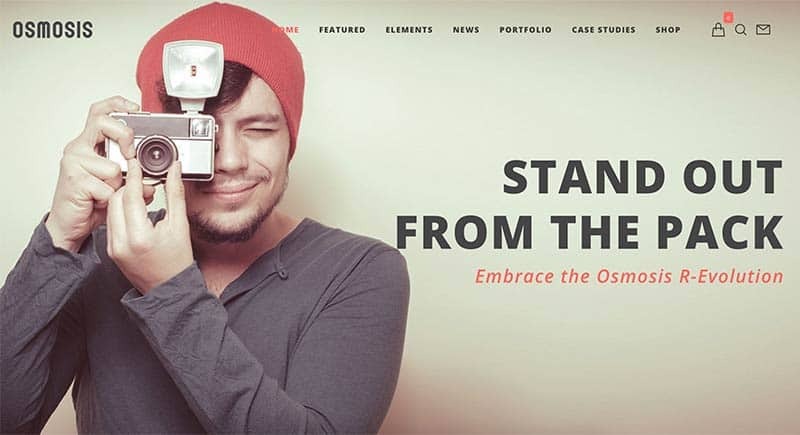 Simply put: it is the most versatile, easy to use multi-purpose WordPress theme. Avada can be anything you wish it to be because of our flexible framework. It has a clean design, a fully responsive framework, industry leading options network and the intuitive Fusion Builder that makes page building a breeze. Avada definitely sets the new standard with endless possibilities, top-notch support, and incredible featured packed updates requested from our users. More information for Avada Theme here. It offers stand-out-from-the-pack options and superior aesthetics; become the designer you have always dreamed of and impress the world simply and smartly. It is ready to setup in different languages and the HTML5 features is something I really like. More information for Osmosis here. Malefic is an awesome looking one-page and multipage WordPress Theme with a unique portfolio to showcase. Show her your different room types, facilities, and events. Malefic was built to be responsive so that it will be compatible on any device such as smart phone, tablet or desktop. More information for Malefic Theme here. Modern, responsive, built for any type of page design easily with an awesome Page Builder. More information for Seller here. 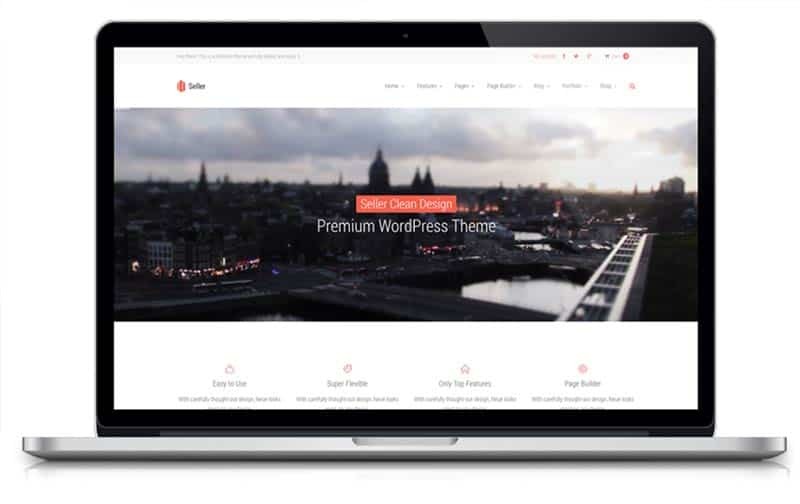 Fildisi is a multi-purpose WP theme that will make the design life of your site much easier. This theme is extremely flexible and can be adapted to your hostel website. Just make sure you deliver high quality photos. A great website has fantastic photos. More information for Fildisi here. 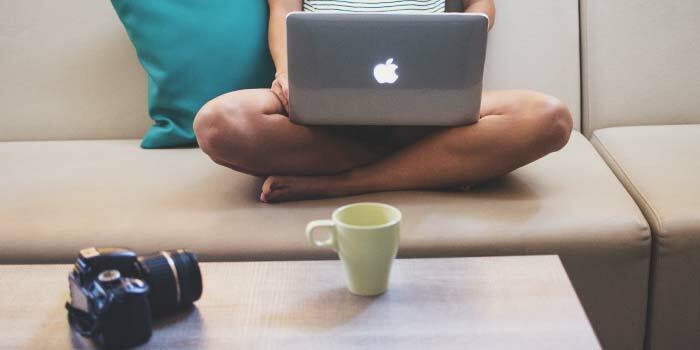 This list is not only featuring cool wordpress themes for hostels specifically. They can be also used as well for hotels, guesthouses, resorts and any accommodation type. There are more themes that could easily fit your needs for a website. Just filter by the search tags, below I list a few examples for features a great theme should cover. WordPress is a software that allows you to setup a website in an easy way and to edit your website content in an easy way. You have access to a so-called backend. From here you can edit the content, upload new photos, add text, remove text, add a jumping kitten and so on. Pro tip: Do not add a jumping kitten! 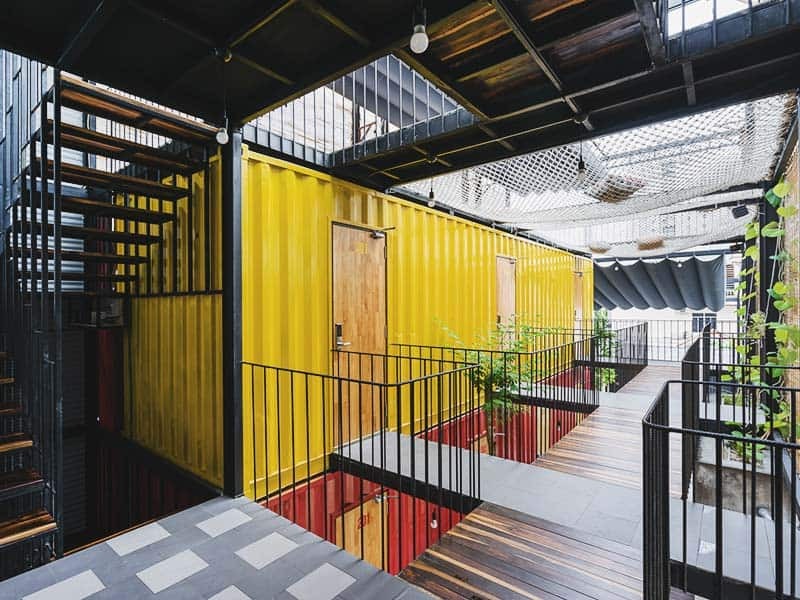 A wordpress system is perfect for hostel owners since they can be a bit more independent from professional designers. However, for starting with a website, I recommend getting a professional web developer. He or she can help you with the setup and the first website. Then, once the website is setup and running, you can edit and add your own content later. Good to know: WordPress is a free to use system! It is 100% free. There are plugins and themes you can purchase. These are usually really affordable, from anything between 5$ to 100$. There are many free themes and plugins. As a professional business, I recommend to go for a paid theme. A paid theme is less used on average around the internet. Meaning, you will find much less websites with the same design. Also, a paid theme is more professional and has no implemented back-door. Some dodgy themes can even be a security risk. They can place ads on your website or take the data from the backend. Now, most free wordpress themes are free. But, you never know. When I started to develop websites with wordpress, I started with free websites. Because, and let’s be honest, it is nice to save 60 dollars, right?! Well, those 60 dollars are extremely expensive once you have to relaunch a new website and do the work all over again when the free them crashes or is simply poorly developed. Therefore: Invest a few coins into a professional theme. You even have a theme support when you purchase your themes on Themeforest. We always buy our themes, plugins and other software with Themeforest. The support is great, very safe to use and the software so far was excellent. They have a quality assurance as well! 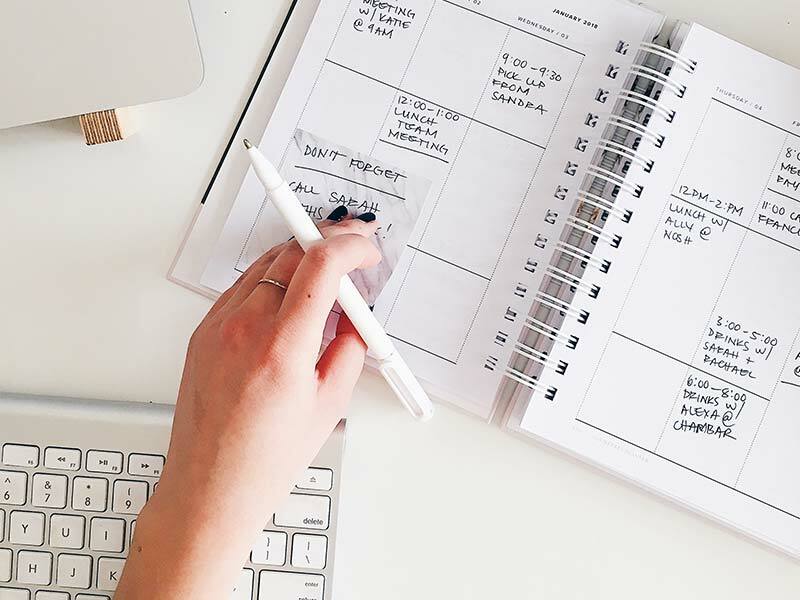 What is important for a website/ theme? When it comes to picking a theme, there are several things you need to check on. Let us have a look on what that exactly is. Here you can find all wordpress themes that match these criteria. I know I am pain when it comes to SEO. I am really bothering you about this topic. Even if you are not into SEO, make sure your website at least is optimized for it. You will be happy to see the results. Remember: once you register with your hostel name on Google, you will be the #1 result for your own name anyway. Good to know: Booking websites buy your name on Adwords and put ads on it to be before your own website. A website should be user-friendly. 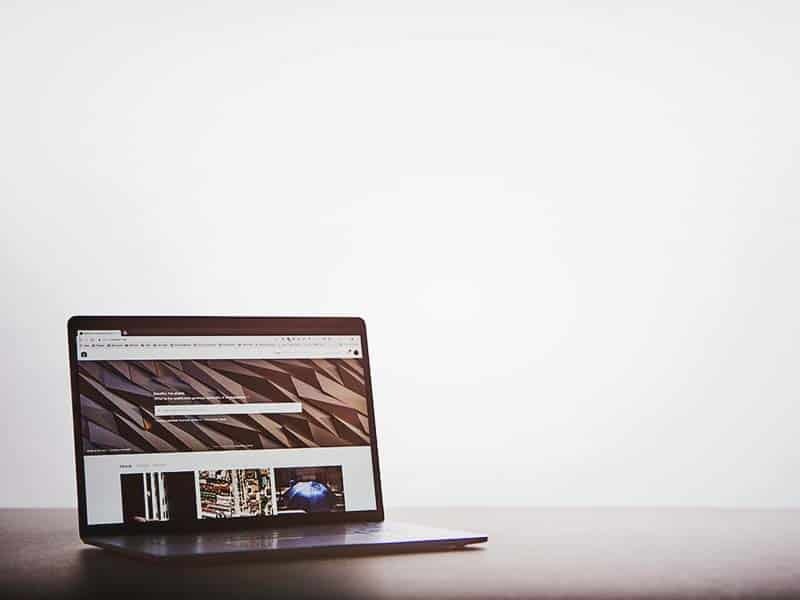 Keep the website clean, the navigation simple. In the menu in the top you don’t need 17 options to click on. Highlight the main function on your website. The main function? That is your booking button! 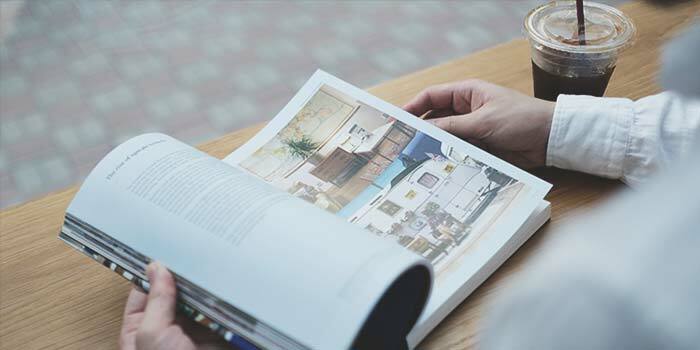 The book-now button is the #1 thing you have to promote on your website. This is the reason why you have the website. This is the part where you make money! Always remember this! A fast website is super important. Imagine your website needs 2 minutes to load. When was the last time you waited 2 minutes for a website? Probably, you’ve never done this. I never did, never! You can check with Google speedtest how fast a website is. It is super easy. Just copy and paste the website you want to test in the Google Speedtest. It gives you the speed for mobile and desktop. Always remember: Design follows function. If you have the most beautiful website in the world, but it is slow as a campervan from the 70s, then you won’t be very successful with it. 60% of the traffic on Hostelgeeks.com comes from mobile. And it is growing. The mobile-first approach of a website is great since it removes all unnecessary items from design and content. A mobile first-page means that it is faster and easier to navigate. Therefore, do not be to focused on the visual appealing part of a website on a desktop. It is important yes, but put mobile first. It pays off! On that note: Pick a hostel booking software that is responsive, optimized for mobile. Here you can lose or win many direct bookings. Do you want to have your website in more than one language? Then you need to have a look that your theme is WPML compatible. WPML stands for “The WordPress Multilingual Plugin“. It costs extra and it is the most professional way to establish your website in several languages. Good to know: Do not try to save a few dollars/ EUR here by using any other system. We use WPML for Hostelgeeks.com, it works like a charme. Check all updated prices on the official website. You will pay a yearly renewal fee, and in total you will pay a maximum 195€ for unlimited usage. 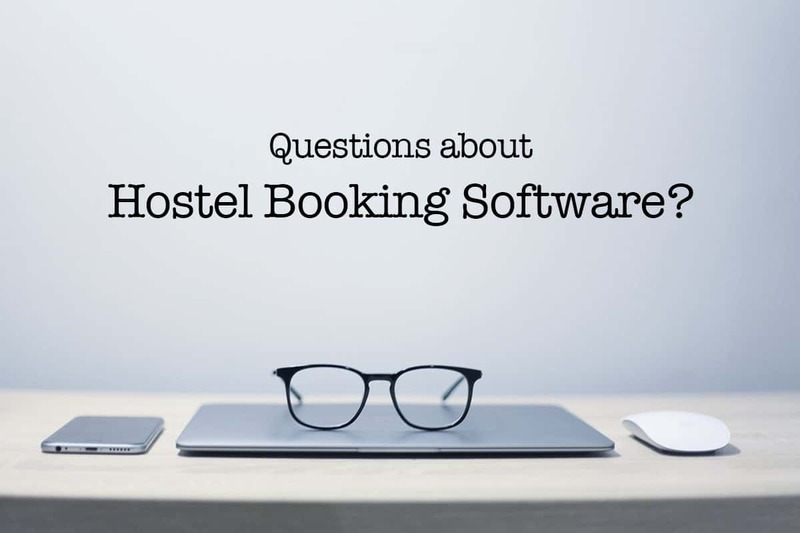 Do you have any questions on wordpress or hostel websites? Then drop us a line or a comment below.